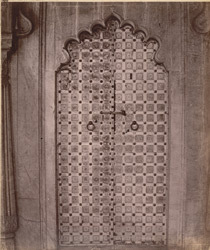 Photograph of a wooden door in the Badi Mahal, City Palace at Udaipur in Rajasthan, taken by O.S. Baudesson in 1882, from the Archaeological Survey of India Collections. Udaipur was established as the new capital of Mewar state by Maharana Udai Singh (r.1567-72) of the Sisodia Rajputs, after the sack of Chittorgarh by the Mughal Emperor Akbar in 1567. The colossal City Palace is located on the east bank of Lake Pichola. It was begun by Udai Singh but dates mainly from the 17th and 18th centuries. It consists of a series of buildings faced in white plaster with steep, fortified windowless walls rising to meet tiers of balconies, towers and domed kiosks at the upper levels. The Badi Mahal, or Great Pavilion, is situated on the north side of the Garden Court of Amar Vilas, inside the City Palace. It has a wide hall with a colonnade of cusped arches. This is a view of a carved wooden door inlaid with ivory in the Badi Mahal.